Founded in the 1960s by the late Sleiman Aboutaam, Phoenix Ancient Art is considered by many experts in the field to be one of the key actors in the international antiquities market. The prestigious galleries located in Geneva and in New York, now managed by Mr. Aboutaam’s sons Ali and Hicham, exhibit an outstanding selection of rare works that make up the essence of Western civilization. Now world-renowned antique dealers, the two brothers grew up among these objects of great beauty, developing a deep love and passion for antiquities. Their collection reflects more than 7,000 years of human creativity, from the 6th millennium B.C. through the 14th century A.D., including a wide range of artworks (jewelry, figurines, amulets, sculpture, pottery) from regions as diverse as ancient Greece and Rome, Byzantium, Egypt, the Near East and the Islamic world. 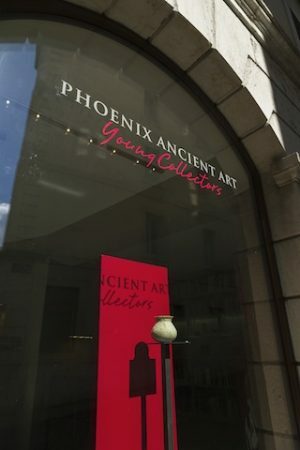 Based in Geneva for over fifteen years, Phoenix Ancient Art has decided to expand its offer and to open up a new space more specifically devoted to young collectors. With the democratization of art, everyone can now buy and live with beautiful artworks. In a continuously changing market, we aim to provide an appropriate and personalized response to anyone wishing to experience the art world. For such a purpose, we offer a large variety of bronze, marble and terracotta pieces, everyday masterpieces of the highest quality, at prices ranging from CHF 1,000 to CHF 20,000. All these objects, evaluated for their esthetic beauty and historical significance, are on display at our new gallery on Rue Etienne-Dumont; they can also be purchased on our website. With this easy-to-use online venue, we offer an opportunity to introduce a new audience to the cultures of the ancient world and to give our existing clients an easy means to expand their collections. Phoenix Ancient Art guarantees the authenticity and provenance of every piece, whether you buy in our gallery or online. Our talented team of specialists, formed by Virginie Selitrenny and Brenno Bottini, looks forward to welcoming you with or without appointment at the gallery located in the heart of Geneva’s old town. Above all, we wish to make this exhibition area a meeting place open to cultural exchange; all requests and budgets will be treated equally, regardless of whether you are a first-time collector or a long-time expert. Among the artworks will be old favorites, but also unexpected finds, always with the underlying commitment to excellence. Sharing our passion for art and for these exquisite works so rich in history is our main concern, because we know how wonderful it is to be surrounded by such beautiful treasures.